Just as some artists are described to have dead careers, some record labels also deserve such tags, especially when their CEOs still hide behind those names to stay relevant in various media reports. 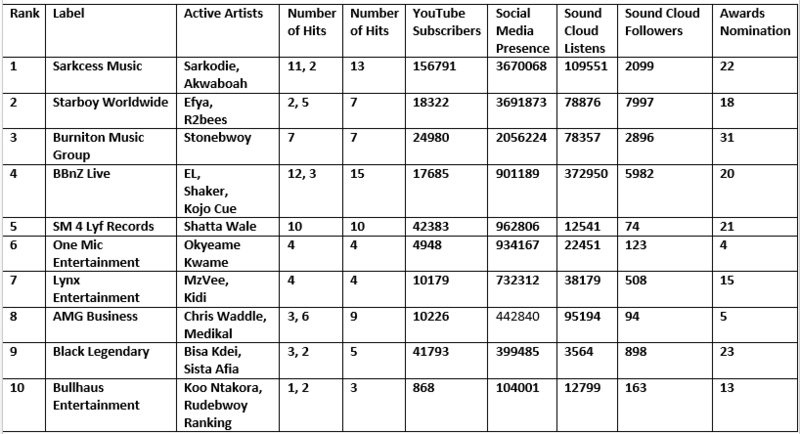 2016 has been an amazing year for the Ghanaian music and generally the creative arts industry. Just as much great music was churned out, artists also flourished with various international recognitions which became a true testament that systems are beginning to work in our local music industry. Even though one cannot attribute all successes chalked due to the policies of the of the Musicians Union of Ghana (MUSIGA), the opportunities the entertainment industry holds today could be a great platform for the more talents to be discovered and transformed into global brands. But one major proponent in the survival of musical acts and the industry around the world today is record labels. In Ghana, the situation is perfectly fit into our systems as musical acts associate themselves with management labels which help them transform their talents into careers and later profitable businesses. Ghana can definitely boast of hundreds of such labels, who by each day are either working very hard or are been under-resourced to manage and promote their musical acts as they are mandated to do. According to Wikipedia, a Record Label is involved in managing brands and trademarks, coordinates various components in music production & Marketing together with enforcing copyrights for sound recordings and music videos. Even though record labels are supposed to boast of Music Lawyers, Publicists, Booking Agents, Business Managers, Personal Managers not all Ghanaian record labels have been able to secure such resources for their business but in a popular term we can state “every record label be record label” as the economy gives them the opportunity to grow to be stout as global record brands. But basically for a musical act to succeed they need a team to support their activities from marketing, publishing, production and Public Relations which few record labels are able to provide in Ghana. 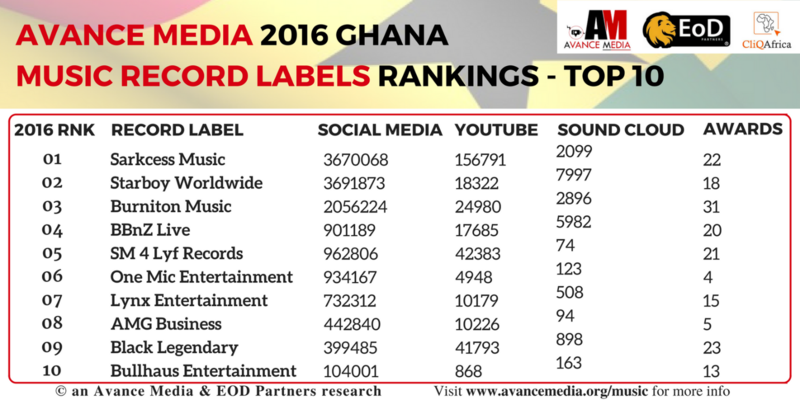 So to scout for the exceptional record labels in Ghana, Avance Media in partnership with EOD Partners lead a research to unveil the top 10 record labels promoting Ghanaians as they placed in a role modelling stature for new labels being birthed across the country and around the world. Our Research also unveiled this Labels to as leaders in the sectors mentioned below. The list compiled by Avance Media, leading Rating Agency and Africa’s leading Media and Public Relations Agency and EOD Partners.